How to Get the Most Out of Your Car Battery? A dead battery can be a big problem. Don’t find yourself stranded. Action Gator Tire put together these tips and tricks to make sure you get the most of your battery. When using a battery, it’s important to make sure you check it regularly for signs of corrosion or other warning signs of a bad battery. By keeping an eye out for these warning signs, you can make sure to notice any problems before they start. That way you can avoid a dead battery and being stuck somewhere with a car that won’t start. If you already have a dead or dying battery, driving it around and having the alternator charge it won’t work too well. A vehicle’s alternator is too busy running all the electronics in the vehicle to worry about charging the dying battery. According to Interstate Batteries, a manufacturer of car batteries, it would take 2,000 miles of driving more than 70 mph to charge a dead 12-volt battery. That’s without headlights, AC or even the radio. Extreme temperatures, whether low or high, can be damaging and can drain car batteries. In the winter, car batteries can be slow to turn over because freezing weather slows the chemical reaction within the battery that creates charge. On the other hand, heat can deteriorate the internal components and lead to premature corrosion, causing a weak charge. You can lessen the impact of severe weather by keeping your vehicle store in a protected area like a garage or covered parking space. 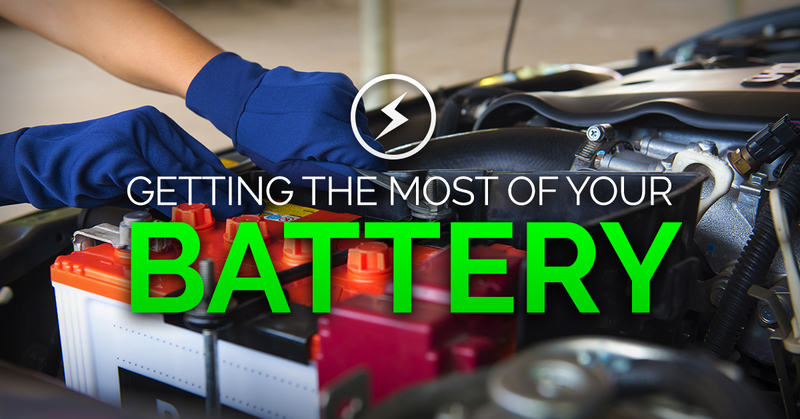 One of the ways to make sure your battery still has life is to check it regularly. The first check is to see if there are any visual defects or issues with the battery. It’s a good idea to perform these checks before the first severe cold snap of the season, and before the heat of the summer sets in. Make sure the connections are tight, and the battery isn’t loose in its cradle. Ensure battery cables are not corroded, frayed or broken. Change them if they’re damaged. If the posts are corroded, unhook the battery cables and clean the terminals and posts with a wooden-handled brush. If your car battery or cables need maintenance, you can always check out the supply of batteries and parts at Action Gator Tire. Remember to always disconnect the battery if you’re going to be messing with the posts. The last thing you want is to send an electrical surge into your car’s delicate electric system. Keeping jumper cables on hand and a portable battery jumper (also called a battery booster) in the trunk can also save drivers from being stranded. These items are more affordable than you might think and can come in handy. Another really good way to prevent being stranded is to have a AAA membership. AAA offers towing for customers, up to 200 miles for Premier subscribers, fuel delivery, and on-site battery service like performing a jump or even replacing a dead battery. By following these simple tips, you can make sure that you can rely on your battery for a long time to come. Speak to the friendly car experts at Action Gator Tire if you’d like to learn more about what you can do for your car battery.